A story: In a synagogue somewhere (it doesn’t matter where), the rabbi instructs the congregation, “Please rise for the Torah processional as the ark is opened and the Torah is taken out.” The rabbi notices one of the synagogue regulars has remained in his seat. He thinks this is odd and makes a mental note to ask Mark during the kiddush following services why he didn’t stand. After the Torah reading the rabbi again directs the congregation to stand and, once again, there’s Mark sitting in his seat. Mark then looked at the rabbi and explained, “Because I’m a gay man. I cannot agree with what the Torah says about me or my friends in the gay community. I’m silently protesting the verse in Leviticus that deals with homosexuals. You want me to stand out of respect for a document that, in essence, calls me morally reprehensible – an abomination. Well, the rabbi thought, on the one hand, it is our synagogue custom that everyone who is physically able to, stands when the Torah is carried around the congregation. But, on the other hand, we subscribe to the democratic ideals of free speech in our country. So, Mark is violating our synagogue policy, our minhag hamakom (our community’s custom), but I also respect him for taking a stand. Now, I must tell you that I made up this story. But it does serve as an appropriate analogy for the ongoing debate about NFL football players “taking a knee” and refusing to stand during the National Anthem before football games as a form of a protest. I’m not going to get into the reasons WHY these professional football players are choosing to protest… some say it’s because of police brutality, others because of our President’s choice words in condemnation of their protest, and others because of the lyrics in our nation’s anthem. What I do want to discuss today is how we ascribe holiness and meaning to objects, and what happens when our embrace of freedom of speech gets in the way of how we feel about these objects of meaning. First, take a moment to think about how you would respond to my made-up character of Mark. If you were the rabbi – or a fellow congregant in Mark’s congregation, what would be your response to his decision to not stand for the Torah processional and recessional because he’s at odds over what the Torah says? It’s a plausible act of conscientious objection. What if a group of women in the congregation refused to stand because they didn’t agree with the Torah’s views of women? What if all the non-Kohanim in a congregation objected to the privileges ascribed to the Kohens and refused to stand when the Torah was paraded? That would be a lot of people sitting down in protest! From just one congregant refusing to stand, it could catch on and then there’d be large-scale protests in congregations around the country – maybe the world. Would we commend the protesters for holding their ground, or would be feel they were disrespecting our Holy Torah? Remember, ultimately, it was humans who ascribed such holiness to the Torah. And it was humans who ascribed meaning to a poem by Francis Scott Key. Is it not each individual’s right to determine if they should stand or sit for the Torah? For the singing of the Star-Spangled Banner? What if someone chooses to sit for the singing of Israel’s national anthem – Hatikvah? Are they wrong? Are they inconsiderate? Or, are they merely expressing their beliefs and making a statement? It’s a challenging situation and it’s certainly more complicated than simply saying everyone who is of able body MUST stand for the National Anthem. Looks look at how this controversy began in the NFL. On August 14, 2016, quarterback Colin Kaepernick chooses to sit for the National Anthem and no one noticed. Mostly because the TV cameras never used to broadcast during the National Anthem unless it was a big playoff game or the Super Bowl. A week later, again Kaepernick sits during the anthem, and again, no one noticed. The following week, he sits and this time he is met with a level of vitriol unseen against an athlete. Even the future President of the United States took shots at him while on the campaign trail. Kaepernick went on to explain his protest had NOTHING to with the military, but he felt it was difficult to stand for a flag that didn't treat people of color fairly. Then on August 30, 2016, Nate Boyer, a former Army Green Beret turned NFL long snapper, penned an open letter to Colin Kaepernick in the Army Times. In it he expressed how Kaepernick's sitting affected him. Then a strange thing happened. Kaepernick was able to do what most Americans to date have not... He listened. "I’m not judging you for standing up for what you believe in. It’s your inalienable right. What you are doing takes a lot of courage, and I’d be lying if I said I knew what it was like to walk around in your shoes. I’ve never had to deal with prejudice because of the color of my skin, and for me to say I can relate to what you’ve gone through is as ignorant as someone who’s never been in a combat zone telling me they understand what it’s like to go to war. Even though my initial reaction to your protest was one of anger, I’m trying to listen to what you’re saying and why you’re doing it." Mr. Boyer goes on to write "There are already plenty of people fighting fire with fire, and it’s just not helping anyone or anything. So, I’m just going to keep listening, with an open mind. I look forward to the day you're inspired to once again stand during our national anthem. I'll be standing right there next to you." Empathy and understanding was shown by Boyer and Kaepernick reciprocated. 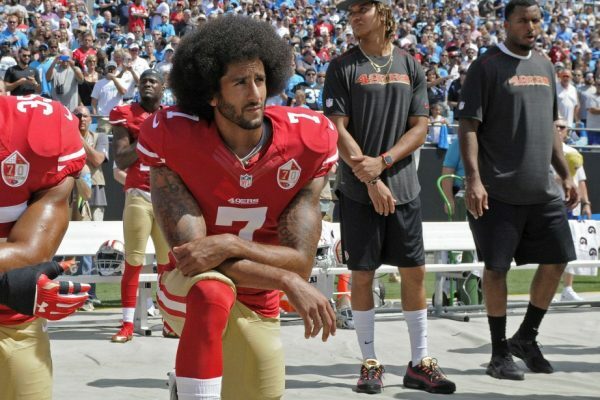 Kaepernick invited Boyer to San Diego where the two had a 90-minute discussion and Boyer proposed Kaepernick kneel instead of sit. But why kneel? In a military funeral, after the flag is taken off the casket of the fallen military member, it is folded 13 times and then presented to the parents, spouse or child of the fallen member by a fellow service member while KNEELING. The two decided that kneeling for the flag would symbolize his reverence for those who paid the ultimate sacrifice while still allowing Kaepernick to peacefully protest the injustices he saw. Empathy, not zealotry under the guise of patriotism, is the only way meaningful discussion can be had. Kaepernick listened to all of you who say he disrespects the military and extended an olive branch to find peace. It’s the backstory that none of us knew existed in this NFL/National Anthem controversy. It’s the human story. The story about listening to others. About tolerance and understanding. About respecting people’s beliefs and not just respecting objects. History has shown us what happens when we ascribe too much emphasis on objects. Nations kill nations over holy sites. Our own Jewish people are sharply divided over a wall of stones in Jerusalem. A retaining wall from the ancient temple that is no longer. A retaining wall that humans have chosen to make holy and revered. But at what cost? Stones have been hurled by one Jew against another Jew because one thinks the other has disrespected that stoned wall. Jews hate one another when one perceives the other is disrespecting the Torah. In our country, we fight over stone statues of bad men from the Civil War. Statues commemorating famous Confederate figures must be taken down under the cover of night so as not to spark rioting in the streets. Who created these things? These stone walls? These stone statues? These holy scrolls? These sacred anthems? Humans. And it was humans who ascribed meaning to them. The irony is biting. The Torah preaches that we must treat each other with respect and yet some find ways to hate the other BECAUSE of the Torah. The National Anthem serves to remind us that our ancestors fought for our democratic rights and yet SOME are trying to silence others’ right to free speech. One person’s protest is another person’s desecration of something holy. Let’s consider all angles of a controversial situation before casting judgment. Might we feel offended if someone refuses to stand as the Torah comes around because they are offended by something in the Torah? YES! But, we also must come to terms with the fact that it is their right to do so and the Torah, in fact, would condone that right. So too, we might not like the look of people – professional athletes or the fan sitting next to us – making a protest by not standing for the National Anthem, but they are exercising their right to free speech, a value we must hold dear as Americans. In the coming New Year, let us all look deep into our hearts and find the empathy that is so needed in our country and in our global Jewish community. Let us commit to listening more and challenging other’s choices less. Yes, we live in complicated times, but we make it so. Let’s take a deep breath and put things into perspective. I’m convinced that doing so will truly make this world a better place. For all of us! Ken yehi ratzon and so may it be. And let us all say, Amen. Shanah Tovah!